Ahhh…summertime: the season of bright whites, stark darks, and every color in between. While these easy-breezy garments may be fun to wear, taking care of them is a different story. Check out Mulberrys’ tips for keeping your casual wear looking its best. – Soften the water: Add a ½ cup of vinegar to eliminate the harshness of hard water minerals. – Skip the bleach! Harsh chemicals break down the fibers of your clothes faster. Add a ½ cup of lemon juice to your next load of whites for instant, toxin-free brightening. – A Pinterest-worthy stain remover: From anything to food or beverage stains to general yellowing and dinginess, use the superhero power strength of 1 part Dawn dish soap, 2 parts hydrogen peroxide to get your clothes looking brand new again. – Prepare for battle: Zip zippers, button buttons, and turn garments inside out. This prevents the amount of friction that occurs against other washer-mates, which helps to keep the garment’s color dye where it should be — on your clothes! – The Rinse Cycle: Opt for a warm wash and cool rinse to preserve original colors. – Bring on the Brights! Take precaution and separate loads beyond just whites and colors. Color-specific loads (dark, bright, and pastel) will minimize dinginess from dye transfer. – Rinse, rinse, rinse! Swimsuits are the official summer uniform, and are consequently exposed to lotions, chlorine, salt, and everything else that the season entails. Even if you didn’t swim that day, it’s important to rinse your suit in cold water to maintain optimal freshness. – Air-dry only: the high elastic content of swimsuits doesn’t like high temperatures, so always let suits dry over a towel bar or drying rack. – Like a day at the beach: Just like your elasticy swimsuits, workout clothes love cold water. The cool temperatures are gentler on the structure of your garments, and will help them last longer. And don’t forget, activewear is also part of the “Air-Drying Club”–consistent dryer use slices the life of your activewear almost in half!! – Odors be gone! While an intense workout is great for you in so many ways, it’s not so nice for your nose (or others’ noses)! But fear not, workout warriors, we have the recipe to solve any and all stinkiness! After your workout, let your battle-worn garments soak in a solution of cold water, detergent, a pinch of baking soda, and a dash of vinegar for 2-3 hours. 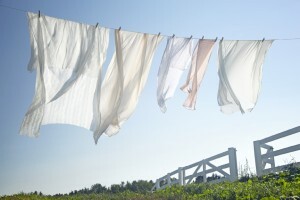 Allow clothes to air-dry (stay away, yucky mildew!) and include the garments in your next load of laundry. Keep these latest and greatest tips in mind, and you’ll be ready to live your summer life to the maximum. But if all else fails, your friends at Mulberrys, as always, would be happy to do the dirty work for you!